Can economic instruments regulate noise pollution in locations near airports? Des instruments économiques pour la régulation des nuisances sonores autour des aéroports ? Economische instrumenten voor de regulering van de geluidshinder in de omgeving van luchthavens? One objective of Brussels Studies is to encourage debate around scholarly articles containing proposals for public action. With this issue, under the heading “double vision”, we are inaugurating a new formula – a dialogue between academics from different disciplines – in this case two economists and a geographer ‑ on the highly controversial issue of noise pollution caused by air traffic at Brussels National. The former propose creating a market for noise emissions as a regulatory instrument, while the latter evokes political responsibility to regulate the matter, based on the principle of limiting the number of people submitted to noise from aircraft. Un des objectifs de Brussels Studies est de favoriser le débat autour de propositions pour l’action publique issues de travaux scientifiques. Avec ce numéro, sous l’appellation Strabismes, nous inaugurons une nouvelle formule où nous faisons dialoguer des scientifiques de disciplines différentes – en l’occurrence, deux économistes et un géographe – au sujet de la problématique très controversée des nuisances sonores autour de l’aéroport de Bruxelles. Les premiers proposent la piste de la création d’un marché des émissions sonores comme outil de régulation, tandis que le second en appelle à la responsabilité des politiques pour réglementer la matière sur la base du principe de la limitation du nombre de personnes soumises au bruit des avions. Brussels Studies heeft onder meer als doel het debat aan te zwengelen over voorstellen voor overheidsoptreden die op wetenschappelijke studies steunen. Met dit nummer, Strabismen genaamd, hanteren we voor het eerst een nieuwe formule waarbij wetenschappers uit verschillende disciplines – in dit geval twee economisten en een geograaf – van gedachten wisselen over het zeer omstreden vraagstuk van de geluidshinder in de omgeving van de Brusselse luchthaven. De economisten stellen een markt voor geluidshindervergunningen voor als reguleringsinstrument, terwijl de geograaf de beleidsmakers oproept om het vraagstuk op te lossen op basis van het principe dat zo weinig mogelijk mensen blootgesteld mogen worden aan de door vliegtuigen voortgebrachte geluidshinder. This project was conducted with the support of Research In Brussels, Institut d’encouragement de la Recherche Scientifique et de l’Innovation de Bruxelles (IRSIB ‑ IWOIB). Université catholique de Louvain (Catholic University of Louvain), CORE and CRECIS, Louvain School of Management and Chair Lhoist Berghmans “Environmental Economics and Management”. 1The issue of noise pollution near the Brussels National airport has turned into a highly political topic. Until now decisions on the number and location of flights over various municipalities were taken by a federal institution (ministry or government) entrusted to federalise the viewpoints of the regional and economic entities involved and to manage the economic and social impacts, especially the health of the residents. In the light of present difficulties, it might be useful to present some economic reflections on this subject. These thoughts revolve around the question of efficiently managing the external effects of airport activity. 2When an airline company inaugurates a connection, it organises a flight that enables passengers to travel, but one that also causes disturbing noise in residential areas. While the “internal” agents of the airline company derive the profits of this flight (revenue minus the costs), the noise pollution must be borne by “external” agents outside this company. Indeed, neither the stockholders, directors, workers or travellers are effected by the noise of this flight. In economic terms, noise pollution is therefore a “negative externality”, for it undermines the well-being of the agents not involved in the company’s economic activity. 3The origin of the problem with an external effect, or externality, caused by an economic activity lies in the fact that its economic and social costs and benefits are not borne by the same agent. Daily life provides numerous examples of externality. A typical example is a dance party planned by your neighbour which will keep you awake. In this case the externality arises because the producer of the nuisance is not concerned by your well-being (a night’s sleep). Economic theory nevertheless points to efficient solutions to this type of problem. One consists in granting you a right to silence. In this case you have the right to ask for compensation on the night of the dance party, for example the cost of a hotel room. If your neighbour considers the cost too high compared to the utility derived from his dance party he will give up the idea. Note here that cancelling the dance party is an efficient result from the social point of view, since it shows that your neighbour’s utility is less than your “disutility”. A second solution consists in giving your neighbour the right to make noise. You can then pay him to rent a dance hall if you really wish to stay in that night, and once again the same argument applies. This is the theory of Ronald Coase, winner of the 1991 Nobel Prize for economy: the combination of (i) a transaction between agents and (ii) a definition of the property rights on the source of an externality can restore economic efficiency. 5First, in most airport sites the property rights to noise belong to neither the local residents (or residents associations or municipalities) nor to the airline companies (or the airport). Therefore socio-economic efficiency is naturally not involved. 7Third, an argument frequently misused asserts that the property prices and rental of real estate in areas inflicted with airport noise are diminished to compensate the owners and/or tenants for nuisance from the aircraft noise. As a matter of fact this argument does not influence efficiency and the socio-economic desirability of airport activity. The money is actually transferred from owner to owner or between owners and tenants; they are not transfers of value between the emitter and the receiver of the noise. Under Ronald Coase’s analysis, to achieve economic efficiency the drop in real estate prices must be completely reflected in the airlines’ profits. 8Lastly, the same remark applies to the NIMBY (Not In My Back Yard) argument whereby individuals (unrightfully) refuse to suffer local disadvantages (in their backyard) arising from a common good that has an overall benefit (for their local area and region). This is the case at hand where we have an airport that causes nuisance for residents living in the flight corridors, but at the same time facilitates the journeys of national and foreign (transiting) travellers. Here again, under Ronald Coase’s analysis, to have socio-economic efficiency the residents’ disadvantages, especially the resulting lower real estate prices, must be completely reflected in the airlines’ profits. 9Economic texts unfortunately have relatively little to say about the choice of economic instruments and institutions that would allow an efficient management of noise pollution caused by airports. Nonetheless, as early as 1972, William Baxter and Lillian Altree3 proposed two solutions. The first consisted in setting up a private airport company that would not only handle the airport’s economic activity, but would also own the adjacent property subject to the noise. This company would naturally find a balance between its economic development and the value of its real estate holdings. Prospects of higher property value would entice this company to arrange for less noisy flights or else sanction flights with the highest “noise/profit” ratio. This solution however hardly seems realistic because it would exacerbate the problem of airport financing and it would also accentuate the airport’s monopoly power over the airline companies. 10Baxter and Atree’s second solution would be to set up an independent, not for profit, institution that would be responsible for yearly evaluations of the variations in property value in the air corridor zones and for compensating the owners for earnings lost. The advantages of this scheme lie in the absence both of the need to finance this institution and of monopoly power. There are several drawbacks however, both methodological and legal. On one hand it is quite hard to distinguish the impact of noise pollution on property value among other effects (such as regional decline, real estate bubble, etc.). On the other hand it is even harder to reach an agreement among the various stakeholders on the compensation to be handed out. If, in the first solution above, such a decision could be taken unofficially by the private airport company (between its “Development” and “Real Estate” divisions), in this second solution it would have to be officialised in the structure proposed by William Baxter and Lillian Altree. Obviously several legal appeals could be expected from the party summoned to pay. Thus both of these economic proposals appear hard to implement. 11In view of the political and legal complexity of the issue of noise management and Zaventem airport, we felt it would be useful to expand our range of regulatory modes. We propose an original solution4 that considers the notion of a market in tradable noise permits (or silence permits) to manage the noise pollution generated by the aircraft flying into or out of an airport. Such a market would enable airlines, responsible for noise emissions, to compensate the local residents who are harmed. Thus the local residents are granted a right to silence and the negotiation between these residents and the airlines is organised around this market. Participation by the municipalities or resident associations located along the air corridors would also make it possible to implement the optimal socio-economic number and spatial distribution of flights among routes. This market could be managed “in complete neutrality” by a computer programme, such as those already employed in markets on energy or carbon dioxide quotas. Involvement by the political authorities is thus unnecessary. Organisation of such a market would not entail the drawbacks of the two solutions proposed by Baxter and Altree. Indeed, it does not require heavy financing or a regular empirical study of the impact of noise on property value; it does not increase the airport’s monopoly power, nor does it lead to litigation on the damages to be paid. Nonetheless, as in any market, proceeds are generated and they are distributed to certain groups of residents as well as to the most cost effective flights. Furthermore this solution nevertheless meets the conditions of socio-economic efficiency, and this without the intervention of political authorities. 12The idea of granting local residents a right to silence may seem provocative. But Ronald Coase’s message must be clearly understood. If the airport activity is unable to survive after the residents are granted this right and can sell them back to the airline companies, this means that the socio-economic costs of air transport exceed the benefits. Thus there is a strong presumption that the socio-economic benefits of the airport exceed its costs. Indeed, Brian and David Pearce, researchers at the University College of London estimated that a very low tax (less than 2%) on air fares would suffice to compensate for the whole set of environmental effects (noise pollution, air pollution, etc.) caused by activity at Heathrow Airport.5 In the case of Brussels National airport, it has been shown that a permanent airport tax of € 12.5 per passenger would yield revenue equivalent to the rental cost of the whole residential area under one of the two air corridors used by Brussels National in 1999.6 In other words, the problem of noise pollution could be completely solved by using just a small part of the revenue from airport activities. 7 For registration and information on this workshop contact Nancy De Munck, ndemunck@ulb.ac.be. 14The text presented has the merit of discussing a highly topical question of airport nuisance. Although it is thought-provoking, it seems to raise more questions than it solves. We shall ignore the fact that the authors make no distinction between daytime and nighttime flights, or that they only speak of passenger flights while night flights, the source of the worst disturbance, are primarily cargo flights. More basically, the text raises serious questions in so far as on one hand it approaches the issue outside the realm of social relations, and on the other it confines itself to the issue of noise pollution without dealing with public safety. We shall try to develop these two remarks in an accessible and non-polemic manner. 15The solution proposed is a scheme directly derived from concepts and methods used in a certain form of economics that works in and with a world that is regular, isotropic and socially neutral, in other words in a bubble divorced from social realities, and in the case at hand, geographic realities since the issue of airport nuisance by definition is part and parcel of physical and human space. Consequently, the solution proposed – a market for noise rights – disregards the social relations that make up our society and that form the diversity of the Brussels region. It appears as an apolitical solution to a problem that is clearly political, even if technical constraints linked to air traffic procedures must be taken into account. At a time when the byword is cross-cutting disciplinarity, something seems to be missing here. 16So, when we take into account the social and geographical facets of the issue under discussion, what can we observe? During the day, 45% of the flights taking off head towards the east of Brussels and its periphery (Evere, Woluwe, Kraainem,…), and as many towards the north/northwest of Brussels (Laeken, Grimbergen, Wemmel,…). 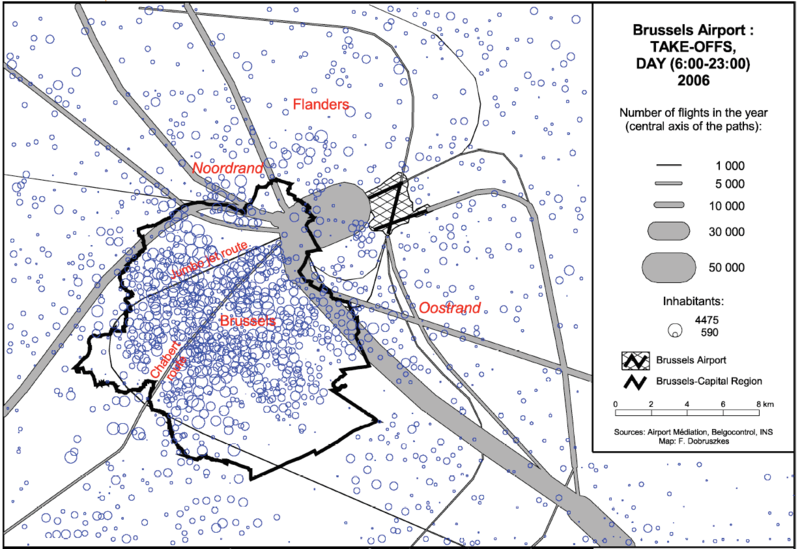 The rest fly over densely populated neighbourhoods in the centre (Schaerbeek, Pentagon, Molenbeek,…) – the “Chabert” weekend route and the jumbo jet route – and over the neighbourhoods located to the north and east of the airport. 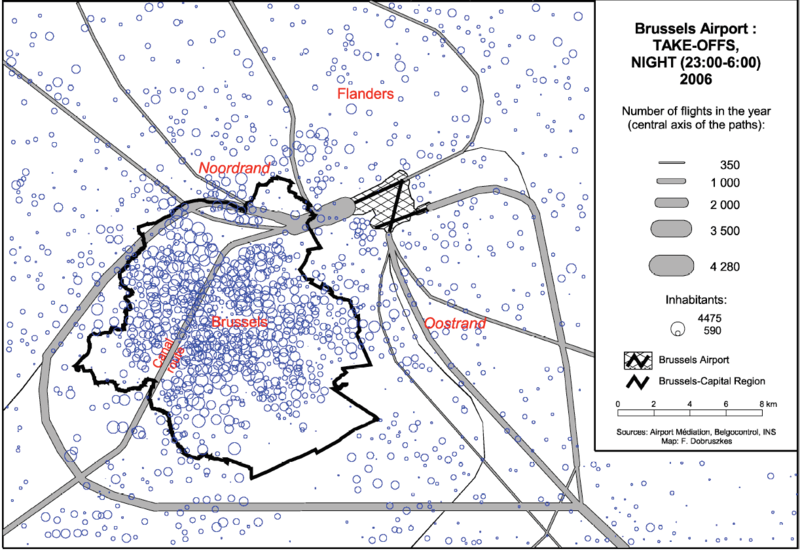 During the night, planes take off over the east (27%), the north (36%), the centre of Brussels via the “Canal”, or “Onkelinx”, route (14%) and over the neighbourhoods to the north and east of the airport (24%) (see figure below for an approximate idea). Procedures leading to flights over Brussels’s eastern and northern neighbourhoods and peripheries were introduced in 1971 to reduce the number of people living in the flight corridors, compared to the former routes that flew over Brussels. 17This simplified geography of flight paths (thus nuisance) reflects a fairly clear-cut social geography: the Eastern neighbourhoods or peripheries, as for a large part the North/Northwest, are particularly well-off areas, while in the central neighbourhoods the population is much denser and tend to be lower-income or else middle class. 18In such a context, what can be said about the solution of a market for rights to make noise? For such a market to be fair, the stakeholders would have to be on equal footing. But all stakeholders are equal only in simplistic theories. It is hard to imagine how rich and poor citizens, or their public representatives, could be on equal footing to negotiate compensation or avoidance of nuisance in exchange for cold, hard cash. One may expect that the lower-income residents will be tempted to accept the nuisance in exchange for additional revenue, either direct (if the money is distributed personally) or indirect (if the money is invested in their neighbourhood). The possibility becomes even clearer in the light of studies showing that populations exposed to noise may well not objectivise the consequences, even as they unconsciously suffer from them (perturbed sleep, lack of concentration,…). Therefore it would be hard to claim that citizens were accepting financial compensation in full awareness of the facts. On the other hand, the residents of better off neighbourhoods a priori have little need for extra money, and would even be able to pay to be free of this nuisance. Consequently, implementing a noise permit market in Brussels entails the risk of a deconcentration of flight paths to the detriment of the lowerincome and densely populated areas of Brussels. 8 Or from their clients, by passing on the costs in plane fares. 21Furthermore, several questions can be raised as to how a market in rights to make noise would be applied. In the first place, the territory concerned by this market would have to be determined, and this inevitably involves a prior political decision. Unless the market’s boundaries were circumscribed, nothing would prevent someone located 50 km from the airport who perceives the far-off noise of an airplane from claiming his due. Secondly, would the negotiation be left up to the citizens or to their political representatives? In the first case, what would happen if just one resident refused flights overhead while the neighbours accepted (or even called for) these flights in exchange for financial compensation? In the second case, the role of politicians obviously would be acknowledged, at the same time raising the question of method (role entirely entrusted to the elected officials, concertation with the citizens, etc.). And going a bit further, should the citizens have a weighted voice (from the sheer point of view of noise, would a mother on maternity leave who is home most of the day count more than her husband working in another neighbourhood, or an elderly person who is hard of hearing)? How would the noise and risks borne at the work place or at school9 be factored in? 10 Or in any other territory if the solution were transposed to other places. 24All this might well sound amusing, except that at the end of the day what is truly at stake is the future of state regulations. Their dismembering, an ongoing activity since the neo-liberal turnabout that occurred in the early 1980s, obviously musters scientific theories that justify this process and help make it possible. What is important lies not so much in their truth as in the political use made of them. In this context, a market for the right to make noise is a sign of the times. But is it truly reasonable to replace State authority, a costly relic of centuries past, by a few computers to lead us to Market Equilibrium? 25We thank Frédéric Dobruszkes for his interesting remarks. First we should like to point out that our article intended to underline the fact that noise pollution is an externality involving local residents (of all social-demographic groups) and the airline operators. According to Coase, this externality can only be resolved by granting one party a right to produce this nuisance and allowing the possibility to compensate the other party. The alternative to such a definition of noise rights is a mechanism called “order and control” by which a regulator deemed to be “benevolent” assembles and processes all the information concerning the social cost of nuisances and their distribution, as well as their benefits for the operators and, if relevant, the workers. This top-down alternative does not seem credible in a federation where successive federal governments have not been able to negotiate true measures (no compensation system has been implemented, for instance), where the regions are unable to reach an agreement on noise level standards to evaluate the nuisance, and lastly where the situation is determined by various jurisdictional decisions. In contrast, the permits market represents a bottom-up solution as the framework for local residents representatives and airline company operations to seek an equilibrium between compensation and nuisance. This solution avoids potential conflicts of interest (of the Communities, for example) by giving the same right to each representative of individuals (ex: Dutch-speaking, French-speaking) living under the flight paths. In his comment, Frédéric Dobruszkes does not seem to demonstrate how a political solution would be more apt to work in concrete terms compared to the market solution. 26Contrary to Frédéric Dobruszkes’s comments, the equilibrium of a noise permits market is fully compatible with a distribution of flights over less densely populated zones. Indeed, for each flight the representative of a less populated zone would request a lower overall compensation for it must be distributed among a small number of residents. In other words, in order to have the same overall level of compensation for his zone this representative would have to accept a greater number of flights. This inverse ratio between population density and number of flights is a feature not only of the socially efficient solution but of the permits market solution as well. 27Furthermore, the permits market solution is perfectly compatible with a time segmenting of flights and permits. As Brechet and Picard have explained (CORE Discussion Paper, UCL, 2007), it is desirable to create one market for day flights (06:00‑22:00) and a second for night flights (22:00‑06:00). As the disturbance, for the same traffic volume, is greater at night than during the day, the price of noise permits would be higher at night. Some airlines will find that it is not profitable to fly at night and will modify either their schedules or their activity structure. Here again, the market solution will be efficient and socially optimal. It does not call for any political involvement, as in the DHL case. 28In his comment, Frédéric Dobruszkes evokes other arguments that are interesting but somewhat beside the point. For example, he highlights the problem of fairness between residents of different socio-demographic origins subjected to the noise. Like Mr Dobruszkes, we also feel that the various flight paths inevitably will pass over populations of different socio-demographic origins. And like Mr Dobruszkes, we fully acknowledge that the markets lack the capacity to promote fairness among individuals with different income levels. Nevertheless, it is not justified to claim that redistribution among socio-demographic classes must come about through spatial allocation of air routes. It is also unjustified to condemn solely the (potential) noise permits market for lack of fairness while all other markets equally lack this capacity. To be completely consistent Frédéric Dobruszkes would thus have to propose eliminating other markets such as the stock market or real estate, consumer goods, etc. In the present context, the issue is to ensure the efficient allocation of flights over urban areas. Fairness generally comes about through redistribution of income and through taxation. 29In his comment Frédéric Dobruszkes also highlights a public health problem; that citizens incorrectly evaluate the impact of noise pollution on health and that this inaptitude is more frequent among the poorest and least educated social classes. In our proposal, the actors in the permits market are local representatives of the residents, for example acting on behalf of residents associations or the municipalities located in the flight paths. Consequently, there is a certain degree of collectivity and democracy in which the debate on public health must be addressed. In actual fact, this issue is indeed present in the demands supported by the residents associations and elected officials of the various municipalities involved. 30Lastly, Frédéric Dobruszkes evokes the problem of a single resident being able to block air traffic by exercising a right of veto or by requesting too high a compensation. This eventuality does not appear in our proposal for several reasons. The first is due to the fact that the residents’ compensation requests are collective and organised by zone. The position of one resident unconditionally opposed to aircraft noise would be mitigated by that of other residents more inclined to accept a certain level of disturbance and receive compensation. The second reason relates to the fact that several routes are open and that total blockage of air traffic implies the blockage of each and every one. The third reason relates to the fact that the residents will always accept a first flight as long as the compensation is high enough. This hypothesis is verified empirically in most hedonic price models12. The final reason illustrates the originality of our proposal which eliminates the problem of the “tragedy of the commons” among the zones located along a flight path. In our proposal, a zone has effectively no incentive to exaggerate the impact of noise pollution and claim an exaggerated compensation for it will not entirely benefit from the revenue of its action. Frédéric Dobruszkes is grateful to Pierre Marissal and Gilles Van Hamme for their helpful remarks. 2 FABUREL Guillaume, CHATELAIN Florent, GOBERT Julie, LEVY Lisa, MANOLA Théodora and MIKIKI Foteini (2006), “Les effets des trafics aériens autour des aéroports franciliens” (The effects of air traffic around the aiports of the Isle de France region), Centre de Recherche Espace Transport Environnement et Institutions Locales, Institut d’Urbanisme de Paris, Université Paris XII. 3 BAXTER William and ALTREE Lillian (1972), “Legal Aspects of Airport Noise”, Journal of Law and Economics 15, 1‑113. 4 Thierry BRECHET et Pierre PICARD. “The price of silence: tradable noise permits and airports”, CORE discussion paper 2007/43 (http://www.uclouvain.be/cps/ucl/doc/core/documents/Brechet-Picard-COREdp.pdf). 5 Brian PEARCE and PEARCE David (2000) “Setting Environmental Taxes for Aircraft: A case study of the UK”, CSERGE Working Paper GEC 2000‑26, Centre for Social and Economic Research on the Global Environment, University College London. 6 Pierre PICARD “12,5 € de compensation par passager” (€ 12.5 compensation per passenger), La Libre Belgique, 30/09/2005. 9 It may be perfectly feasible that noise bothers people more at their workplace or school than at home. 11 Which would not spare public authorities the task of conducting a more reasonable regional planning policy, in particular as regards building permits granted to build housing in the noise zones of the northern and eastern peripheries. This obviously opens the debate on compensating the owners of land zoned for housing, but not yet built. 12 For example, the low level of air traffic at the Tempelhof Airport (Berlin) does not seem to perturb the residents who have called for it to continue its activity. Thierry Bréchet is currently Professor of Economics at UCL and holder of the Chair Lhoist Berghmans in Environmental Economics and Management. He is also member of the Center for Operations Research and Econometrics (CORE) and of the Strategic Management Unit (POGE-IAG) for its research activities. In 2000, he received his PhD from the University of Paris I Panthéon-Sorbonne. He worked as a consultant (1999 to 2001), mainly on research projects related to development, environmental and sustainability issues, before joining the UCL in 2002 at the opening of the Chair Lhoist Berghmans. Frédéric Dobruszkes, a Doctor in Geography, is a lecturer at ULB-IGEAT and researcher in transport geography at ULB. He is the author of an article entitled “Éléments pour une géographie sociale de la contestation des nuisances aériennes à Bruxelles” (“Elements for a social geography of protests regarding airport nuisance in Brussels”), to be published in Espace Populations Sociétés, No. 1‑2008.